On June 6, Director of Hoa Binh Hospital, Dr. Truong Quy Duong confirmed that the professional council is reviewing the professional procedures and that no anaphylactic shock has yet been concluded. 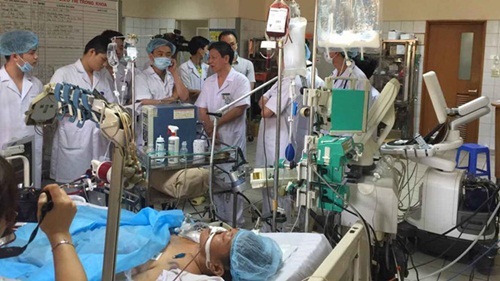 According to the latest updated information, Duong said that the authority concluding that the cause of the anaphylactic shock in 18 extremely long-term dialysis patients belonged to the Ministry of Public Security. Lecturers are teaching diploma degree 2 College of Pharmacy Hanoi - College of Medicine and Pharmacy Pasteur also very much expect the authorities to come to the conclusions to clarify the case. On professional work, Director of General Hospital of Hoa Binh province confirmed that the hospital is in the right procedure, there are tests for patients before dialysis. In the case related to Thien Son Company, Duong said that Thien Son company only repair water filtration system, not repair dialysis machine, so it is difficult to say is due to poor machine quality. Require the hospital and water supply system maintenance unit to coordinate with the Investigation Agency to find out the cause of the problem. At the same time, the professional council is set up by the head of the Health Department as its chairman. Council members have specialists involved in the procedure of dialysis, such as artificial kidney machines, operating procedures, drugs, chemicals, consumables, electricity, water ... of Bach Mai Hospital, hospital Kidneys Hanoi ... and other related fields are invited or appointed by the Department of Health. Assoc. Prof. Dr. Luong Ngoc Khue also requested the Department of Health to work out a plan and to select a treatment facility to support 100 patients who need dialysis early in the local dialysis. The delegation visited and surveyed at Hoa Binh City Hospital and discussed with Hoa Binh Department of Health to expand the artificial kidney department there. In the immediate future, it is necessary to supplement Hoa Binh City Hospital with 10-15 hemodialysis machines to assist hemodialysis patients not to filter periodic Hanoi. Guidance on the technical process of washing and reusing kidney filter results issued in conjunction with the Minister of Health's Decision No. 1338/2004 / QD-BYT dated 14/4/2004, the regulations on infection control, Review all the steps for the preparation of the artificial kidney machine, dialysis filter, water treatment system, kidney dialysis machine, cord blood, needles, anticoagulants, anti-anorexia box, , Medical records and other related contents of hemodialysis. 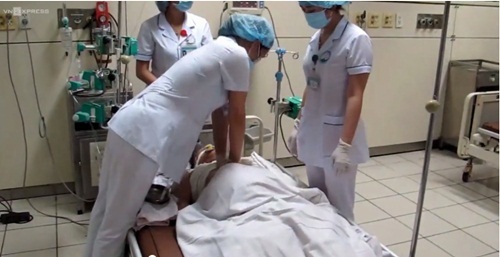 Previously, morning 29/5, at Hoa Binh General Hospital 18 patients reached dialysis cycle and then 40 minutes, all 18 patients with signs of anaphylactic shock such as vomiting, abdominal pain, itching and many The patient falls into a coma. By the end of May 29, seven patients died after anaphylaxis. The patient Nguyen Bich Ng. 45, died on June 4. This incident has been considered by the Ministry of Health and the whole country as this is the most serious medical problem in the history of the dialysis industry. All students attending Pasteur College of Medicine also pay special attention to the medical incident.